As Halloween draws closer have you given any thought to what you might be playing on Halloween night? Whether you have a Halloween party or you're just getting set up for the onslaught of Trick or Treaters, you want to set the mood, right? ...a sequel to the very popular Pumpkinland CD, called (as sequels usually are) Pumpkinland II, by Mark Harvey. Not music, exactly, the tracks on this CD are beautifully conducted soundscapes, designed to create atmos'fear' described by the track titles. These tracks when applied to the correct room, will compliment the eeriness without overpowering the sets. The selections are longer than most so as not to drive you actors insane from the repetition. The choice of sounds to make up each piece is precise so as not to detract from the mood being set. Unless you are a total Halloween junkie like me, you may not keep this CD in your walkman or car CD player, but for spooky background fill for your attraction, you cannot go wrong with this sequel, which unlike the movies is as good or better than the original. Let the fun begin!! PUMPKINLAND II is the follow-up to last year's successful CD and contains eight new soundscapes for your listening and haunting pleasure. Nobody Records effectively mixes dark, brooding tones with a variety of effects to help create an atmosphere for a wide range of haunted scenes...this one even includes a very interesting mix that places you in the midst of a spooky rain forest. What really makes PUMPKINLAND II work is the use of low tones and the psychology that goes behind using sub-woofers to scare your patrons. It is a proven psychological fact that very low tones have the ability to unsettle the majority of people, especially when it is a low tone that can be felt but not necessarily heard. These "felt but not heard" low tones are what PUMPKINLAND II capitalizes on. Eight new haunted soundscapes lie waiting in PUMPKINLAND II, available from Nobody Records. The tunes evoke an eerie mood without being overpowering. With titles such as "Lagoon", "Caverns", and "Nightfall", this recording effectively blends sounds of the great outdoors to create the soundscape of a spooky night. Awesome! 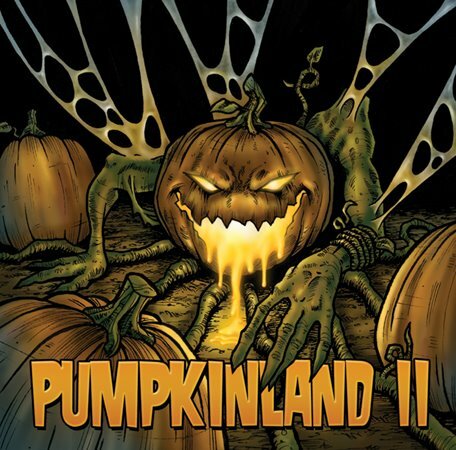 The Pumpkinland II CD is an excellent Halloween Soundscape from Nobody Records. Pumpkinland II is not your average Halloween sound effects CD. 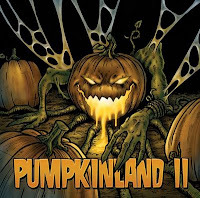 Since the Pumpkinland II CD is a soundscape and not just a sound effects CD, it helps creates a very spooky atmosphere that you can play during a professional Halloween Haunt, gathering, or to play for trick-or-treaters. The recording quality and recording level is excellent. The Pumpkinland II CD is highly recommended for any Halloween enthusiast. It is a great companion CD for Pumpkinland I. I sincerely recommend visiting http://www.13thtrack.com/and listen to a few samples. First a haunter must ask, "What do I want the sound to do?" Is the haunt to be built around a theme that requires a tightly woven sound track to help enhance the storyline? Or, as is often the case, does the haunt need a background soundscape to merely set the tone a haunter desires? If your desire is in the latter category, take a listen to Pumpkinland and Pumpkinland II. The creator of the Pumpkinland cd's does soundscapes and does them well. Built primarily of skillfully layered sound effects, these soundscapes provide a series of background tracks that are eerie, effective and, in some cases very long allowing almost gap-free use. While not as music based as some others, the tracks definitely have a place in the industry. Used in sets such as cemeteries and other outdoor scenes the final tracks of both I and II are superb. Pumpkinland shows it's true strength in mixes that are tailored for the night with wind, weather and animal noises perfectly balanced whether the application is subtle or at full volume. The variety of tracks on each cd does cover multiple types of scenes however, and haunters will find them useful in many other scenarios. Perhaps the only shortcoming of Pumpkinland is the packaging. It tends to portray a more simple and "Halloweenie" product than is hidden within and may unfortunately "put off" some serious haunters. Don't let it fool you, underneath the somewhat mainstream cover is a product sufficiently dark for most applications and far removed from the "scary sounds" cd's found in retail stores that it unfortunately may bring to mind. While the soundscapes of Pumpkinland may not have the recognizability of music-based haunt tracks, nor are they presented in slick packaging, they are well produced and provide yet another valuable tool to the industry. Take the time to visit their web site and listen to the product. It could well be just the thing you've been looking for.